Dingdong Dantes maintains that he doesn’t have plans of running in the 2016 elections. Echoing what his soon-to-be wife Marian Rivera said, Dingdong Dantes claimed that he also wants to focus with his upcoming family after their wedding. 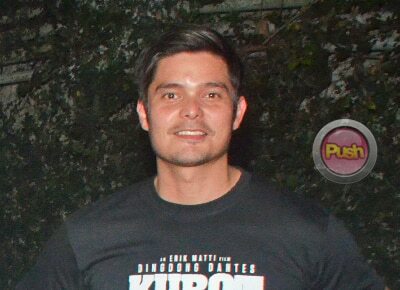 In an interview with Dingdong during the recently-concluded press conference of his Metro Manila Film Festival entry, Kubot: The Aswang Chronicles 2, Dingdong shared that he wants to have a baby by 2015. Dingdong and Marian are set to wed on December 30 at the Immaculate Conception Cathedral in Cubao. With Dingdong keen on becoming a dad soon, he just brushed off the idea that he made it to the Top 20 2016 Senatorial election survey. “If you ask me right now I really don’t have any plans. Sa ngayon po talaga ang concentration ko talaga is to build my family,” he claimed. With their being vocal about building a family, Dingdong as early as now claimed that Marian might take a short break from showbiz if she indeed gets pregnant with their first baby in 2015. But he quickly explained that they won’t be gone from the limelight permanently. “No naman, it depends on the circumstances pero sa ngayon kasi wala namang kasiguraduhan eh and para sa amin marriage naman doesn’t mean that it’s the start and end. Start of slowing down when it comes to your job and your career as an actor. Parang all the more nga na mas dapat mahalin mo siya because you’re doing it now for a family, for a wife and for a husband,” explained Dingdong who plays the role of Aswang-slaying Makoy in The Aswang Chronicles movie franchise. Meanwhile, with their wedding happening in less than three weeks, Dingdong shared that they have yet to pick a honeymoon venue. Although one thing is certain, they are taking a leave after their big day. “Humingi po kami ng leave pero sandali lang. ‘Yung sa akin mga less than a month. Actually may deadline kami sa nagbo-book sa amin eh. Dapat by tomorrow meron na kami. Europe siguro. South, Italy. Pero wala pa ngang kasiguraduhan,” he said. The actor-producer shared that the reason why his leave with Marian would be short was because he’s set to host a reality show next year while Marian is slated to be part of a soap opera. Kubot: The Aswang Chronicles 2 is one of the eight entries in this year’s Metro Manila Film Festival come December 25.